Center for Advanced Legal Studies is a paralegal school that has specialized exclusively in the education of paralegals. The Center for Advanced Legal Studies (CALS) is a college that specializes exclusively in the education of paralegals, and is one of the only paralegal schools offering both traditional and online classes that are approved by the American Bar Association. Though CALS’s website was redesigned recently, the organization feels the site is bland, cluttered and doesn’t accurately portray the mission and values of the school, leading to a lack of prospective students finding the school and requesting additional information. CALS approached LyntonWeb to help redesign the website to better appeal to students accurately reflect the school’s educational objectives. 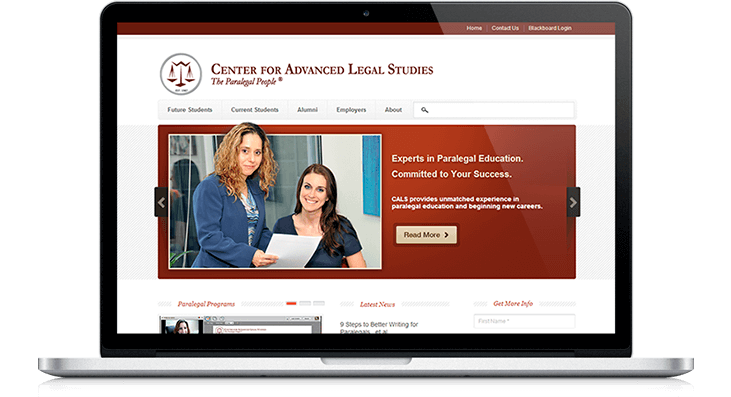 The Center for Advanced Legal Studies just started with inbound marketing, so our team custom designed and built the website on HubSpot to allow for easy updating of content, blog posts and landing pages.